Berlin International Film Festival: Inspiration at Berlinale Talents! This February I was catapulted via a 24 hour trip, from Melbourne’s summer to the middle of a Berlin winter and the biggest film festival in the world: Berlinale – the Berlin International Film Festival. It was pretty amazing meeting the other talents from all disciplines – producers, composers, editors, cinematographers – and to be surrounded by industry and filmmakers sharing their knowledge and experience through panels and discussions. Also, I was able to connect with ‘the native crew’ – some of the indigenous filmmakers and industry that I’ve been privileged to meet on my travels to the USA, Canada and NZ in the last 18 months. It’s so great to have that immediate connection to this community especially when travelling to a new place. I was spotted by someone after being in Berlin for 10 minutes! TOP: With Maya Solis of the Sundance Institute Native and Indigenous Film Program at the NATIVe stand as part of the European Film Market. LEFT: Berlinale Talents party with writer/director Lucy Gaffy (AUS), actor Elit Iscan (TURKEY), actor Pitobash (INDIA). RIGHT: with former fellow Merata Mita Fellowship recipient Ciara Lacy (Hawaii). The theme of this year’s Berlinale Talents was ‘secrets’. So there was lots of revealing secrets and mentioning of the word ‘secrets’, shhhh don’t tell anyone! 🙂 Highlights included a discussion called “Dead or a Life? Passing Away on Screen” with filmmakers Kamila Andini (Seen and Unseen) and Lucile Hazdihalilovic; an acting workshop ‘The Non-Actor in You’ with Josephine Decker where we did things like let strangers lead us around the room with our eyes closed (argh! ); getting behind the scenes of a Wes Anderson production with storyboard artist Andrew Amondson; participating in a ‘speed dating’ dinner with 400+ filmmakers and film industry professionals; hearing Gus Van Sant and Willem Dafoe talk about their careers; walking the streets of Berlin in it’s wintery beauty; eating standing up in the street between films and events; and of course getting to meet an international community of passionate and talented fellow filmmakers. This was one of those times where I felt completely inspired. Although the weather was frosty it was a heart warming experience that’s for sure. I feel privileged to have been able to attend. Thanks to Screen Australia for funding my way there. The Non-Actor in You’ with Josephine Decker. RIGHT: Willem Dafoe interview. 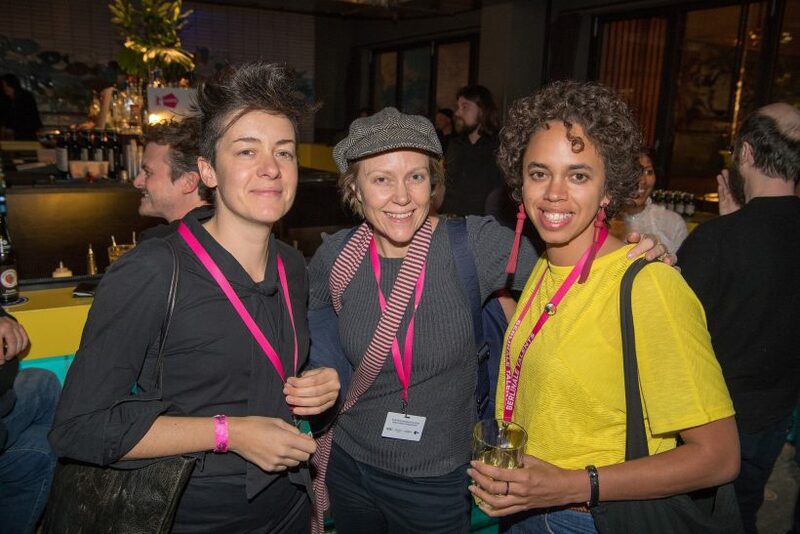 Featured image: Berlinale Talents party with composer Camilla Uboldi (ITALY/ MEXICO), writer/director Bec Peniston-Bird (AUS). Image © Peter Himsel, Berlinale 2018 via Berlinale Talents Facebook.